I loooove seitan! It's cheap, low carb, high protein and super tasty. This new recipe is even lower in carbs and meatier than my 'basic seitan' recipe that I posted a few weeks ago. It is a little bit more work to make, but still really easy. The combination of vital wheat gluten and pureed tofu gives this seitan a tender bite and the special kneading technique creates a super meaty fibrous texture. You can tear it into pieces and use it in stir fries and stews, or even shred it with a fork to make vegan pulled chicken. Add all the ingredients except for the vital wheat gluten to the jar of your blender of food processor and puree them to a completely smooth batter. Pour it into a mixing bowl and mix in the vital wheat gluten with a spoon until it starts to form a dough. Turn the dough out onto a clean work surface and divide it into two pieces. Knead each piece folding it, pressing it flat and folding it again. Repeat the folding about 10 times, so the gluten gets a layered texture and forms long stretched fibers. Form the pieces of kneaded dough into rolls and wrap them loosely in aluminium foil to seal in the moisture and flavor during steaming or baking. Preheat your oven to 175 C / 350 F OR bring water to boil in your steamer pot. Bake the seitan for 100 minutes OR steam it for 45 minutes until it has expanded and is firm to the touch. Let the seitan cool down and tear or shred it into little pieces along the natural fibrous grain that was formed during the kneading. You can also cut it with a knife, but I prefer the texture of the shredded pieces. The seitan will keep for a few days in the fridge, or for a few months in the freezer. Basic low carb seitan Lettuce wraps with olive-lemon seitan Vegan low carb muffins, lemon poppyseed flavor! Low carb tortilla wraps, vegan! Hi Diane! Oh dear, I'm afraid the 175 is celcius, so about 350 fahrenheit. That's why your seitan is still mushy. I'm so sorry, I forgot to add the degrees in fahrenheit. I'll go correct it now. If you still have the dough, I would just return it to the oven and bake it some more on 350. It will probably turn out okay. Thank you so much for your reply! I actually tore it in pieces and fried it. I will work in salads and won't go to waste! I will try this again tonight!! Thanks again! Hi Diane, sorry it didn't turn out as expected! Seitan can be a little bread like sometimes, but this recipe is supposed to be nice and tender. 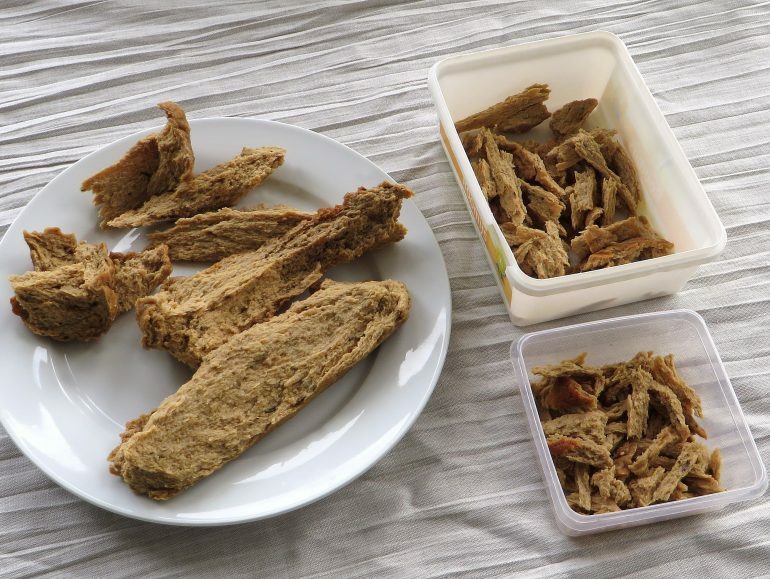 Were you able to shred the seitan into pieces? It might still be good if you sauté the pieces in some oil. It's still in the refrigerator, I might try. It seems a little tough tho....What could I have done wrong? See what it's like when you shred it. You might not have done anything wrong. You could try adding a bit more liquid next time. Hi Arista, you could make the dough into tenders and steam it that way (the cooking time will be shorter for smaller shapes). Alternatively, you can shape the dough into a log and cut it into tenders after steaming. Just made these for the first time! Turned out tasty, but not really like chicken. I've put it in the freezer for now, will probably use a chicken spice mix when I fry the seitan :-) I'm amazed by the high protein content of this recipe btw! Hi Alynda, glad you like it anyway! Kneading/folding helps it become more chicken-like. Pressed or unpressed tofu? Figure that's going to make a big difference to the finished product so just want to check. Hi Jessica, I usually don't bother with pressing the tofu unless it is very wet. It doesn't matter that much actually. This recipe is hard to mess up. Glad it turned out so well for you Janis! I tried this recipe and also ended up with two loafs of bread, there was nothing even remotely seitan like about it, I screwed up somewhere I guess! I thought that tarwegluten and vital wheat gluten were the same and I am thinking they must not be at all. That's strange Ruka. Vital wheat gluten and tarwegluten should indeed be the same thing. I also use Dutch tarwegluten for this recipe. Thanks for your feedback Adrienne! Thank you Lindsay! Glad it worked well for you. This is still one of my favorite recipes too. Tried it for the first time and it turned out so yummy!i baked it on my grill at 350. I will be making again. That's great, glad it worked out for you!